Let’s admit it. Chicken Macaroni Salad is one of those tried and tested recipes that everybody loves. It shows up on every occasion and celebration especially Christmas. This season my diet hasn’t taken a back seat but I allow occasional cheat days because, hey, ’tis the season to indulge — even just a little. Today, I made Del Monte Chicken Macaroni Salad. Let’s just say, I’m taking Del Monte’s recipe for a “dry run” before making a big batch on Noche Buena or Christmas Day. 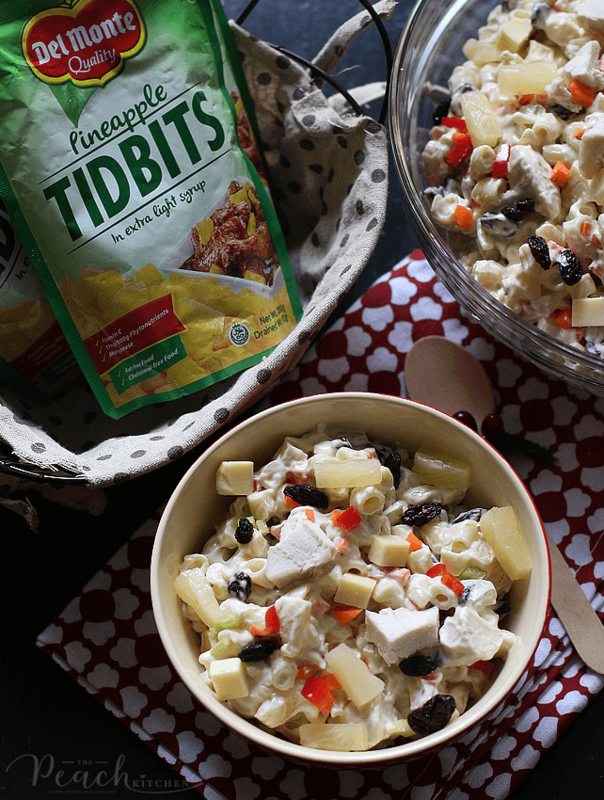 Del Monte’s version has bits of pineapple that adds a really refreshing twist to the classic macaroni salad. Well, to tell you honestly, I’ve been adding lots of pineapple tidbits in my macaroni salad ever since I first learned how to make it. What makes Del Monte’s version new to me is the addition of red bell pepper, pickle relish, and the reserved pineapple syrup. It also has onions but I decided not to add it since our family doesn’t like onions in our macaroni salad. 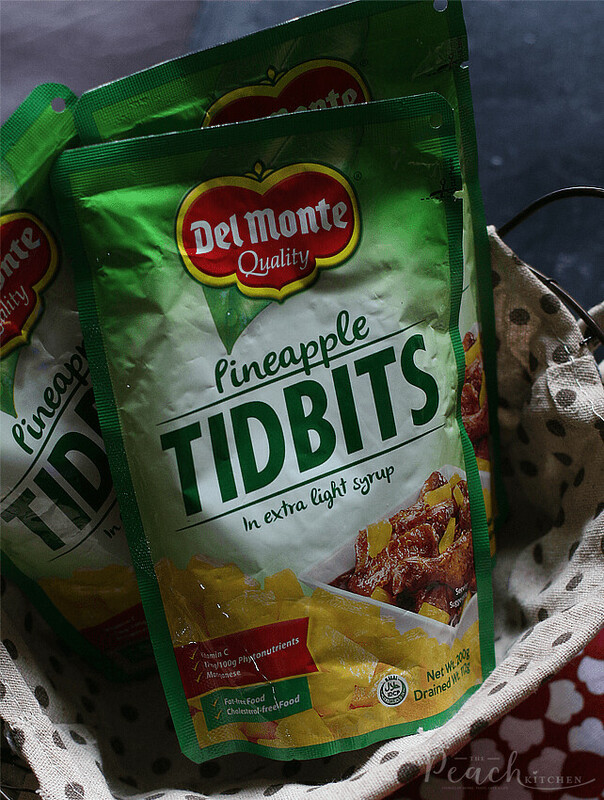 But of course, I put lots of Del Monte Pineapple Tidbits. It gives the classic macaroni salad this sweet and tangy taste that balances out its creaminess. I love the new packaging of Del Monte Pineappple Tidbits too! And these pouches because it’s easier to open than the can. We already finished two bowls of this macaroni salad today. It’s creamy, tangy, sweet, — and just delicious. I can eat this everyday. It’s great for merienda and as a side dish to roasted chicken or baked fish. Below is the adapted version. Since we are only four in the family, I cut the recipe in half and omitted the onions . 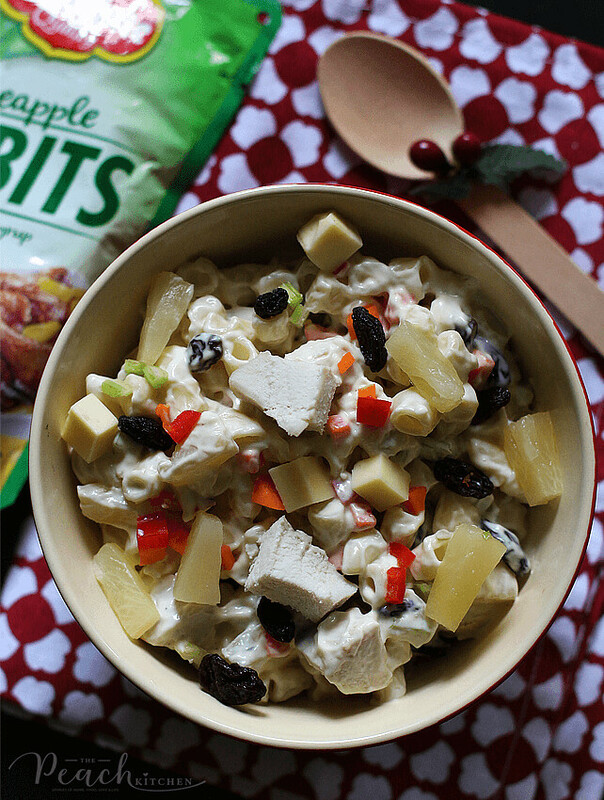 Click here for the original version: Del Monte Chicken Macaroni Salad. Combine mayonnaise and reserved pineapple syrup. Combine all ingredients and ¾ of the cheese. Chill then top with the remaining cheese. Lusog Notes:This Chicken Macaroni salad is a source of vitamin A which helps maintain normal vision and healthy skin. It also has iron needed in the formation of red blood cells that distribute oxygen to the rest of the body. Chef's Tip:The reserved syrup makes the consistency of the mayonnaise thinner and easier to mix with the other ingredients. It also adds additional moisture to the salad. Love the idea of pineapple! This looks wonderful — thanks. Gotta love a good salad =) thanks for the recipe! It’s a little different than what I’ve tried, so I’ll give it a go one of these days. This looks really good. I have eaten macaroni salad in the past, but it was very different than this. I’d never think of putting pineapple and macaroni but this looks really good and delicious. OK I totally want to try this salad like now it sounds absolutely amazing, and yet I wouldn’t have thought of mixing things like pineapple, macaroni and chicken to make a salad. Yum, this looks so delicious! I need to make this soon for a side dish. I just love pineapple. Booking this recipe! My family would adore it and i think it looks yummy! Ooh! This recipe is looking so scrumptious. Def pinning for Sunday dinner. Goodness! I love macaroni salad. This looks super yummy. I am going to have to try it ou asap! Ooh you have just given me inspiration for my meal tonight. 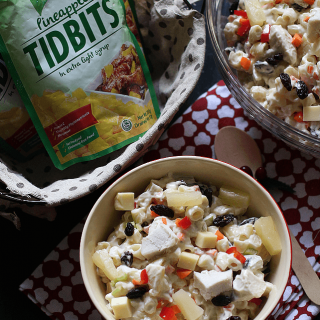 I am a vegetarian but I love the idea of a mac salad using quorn chicken and those del monte pineapple tidbits look delicious! Oh wow, this is delicious! Love the ingredients, would love to try it! I love using Del Monte. It has so much flavor! This looks like a real delicious salad. 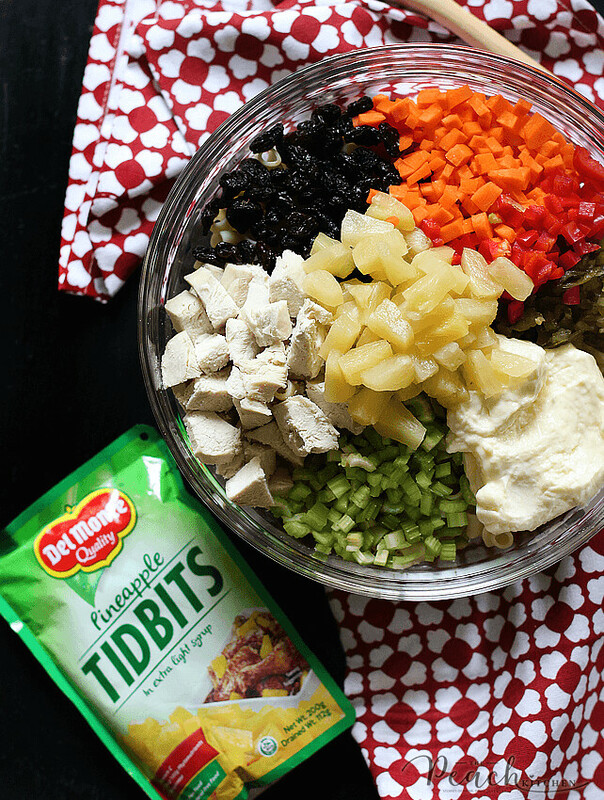 I have never used this mix of ingredients but it is always nice to try something new and healthy. The older I get the more I like to put pineapples in different foods. I know its the Caribbean in me. Oh wow never thought of adding chicken in a macaroni salad but sounds tasty. Can’t believe how easy this salad is. and those pineapple tidbits look so good. This looks like such a yummy but easy recipe to make. I have pretty much everything at home except for those pineapple. Great post! Hmmm..such a yummy Macaroni Salad recipe. This looks delicious and divergent from the ones that I had before. This looks amazing and delicious and not to mention healthy. I am so going to make this for myself and my kids. Wow! Great salad recipe for dinner. And the ingredients looking healthy and full of nutrition. 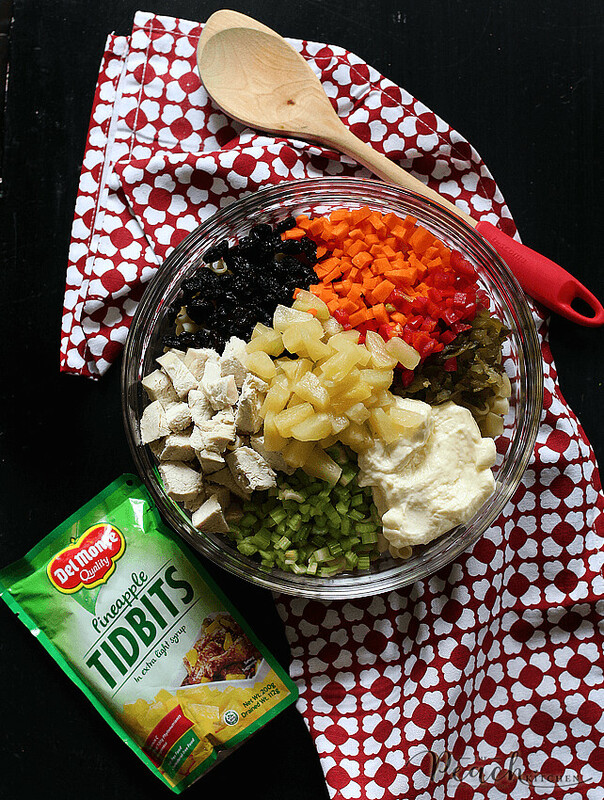 Good news for me, Pineapple tidbits into the ingredients. Thanks for sharing!